vscode 에서 Maven for Java 를 사용 해 보자. 아래 3개의 extension 을 설치하자. 여기 서 download 를 하자. 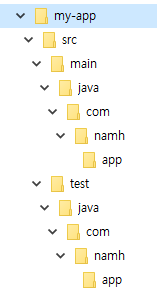 (apache-maven-3.5.4-bin.zip) 을 다운로드 하면 된다. 그리고 원하는 경로에 압축을 풀자. 여기서는 아래 경로에 풀었다. Maven – Installing Apache Maven 에서 얘기하는 것처럼 Windows 에는 2가지를 해줘야 한다. cmd 를 열어서 mvn -v 를 해서 동작하면 설정이 잘 된 것이다. 아래처럼 해주면 간단한 project 를 하나 생성할 수 있다. 참고: maven 의 Archetype : maven 의 Archetype은 maven template 을 자동으로 생성해주는 tool 같은 것이다. 자신만의 archetype 을 생성할 수도 있고, 기존에 만들어진 archetype 을 사용할 수도 있다. 이제 command pallet (ctrl+shift+p) 에서 아래처럼 maven compile 을 하자. compile 이 다 되면 F5를 눌러서 debugger 로 run 을 하면 된다. F5(debugger run) 를 누르면, launch.json 이 생성된다. 다시 F5 를 누르면 실행된다. 브라우저를 열고 localhost:8080 으로 접속해 보면 화면이 보인다. 간단한 hello world with spring 5 > tomcat의 debug port 열기 를 참고하자. Tomcat for Java - Visual Studio Marketplace : 이것은 war 을 debug 하는 기능은 있지만, 윈도우10에서 제대로 동작하지 않았다. war 을 선택해도 제대로 webapp directory 에 copy 하지 못했다. 이부분만 해주면 되지만, 여러모로 그냥 .bat를 task.json에 등록해서 사용하는 것이 나은듯 하다.